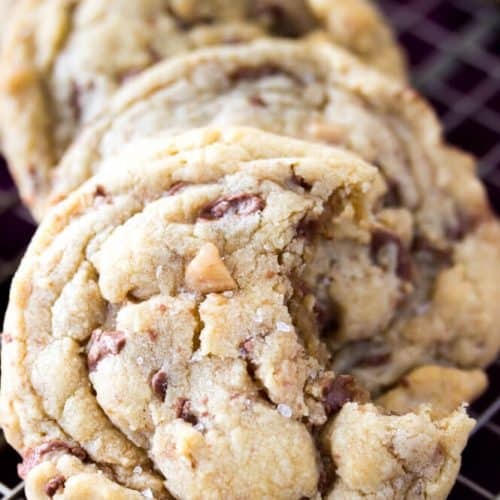 Sweet, soft cookies packed with toffee pieces and just slightly salted. 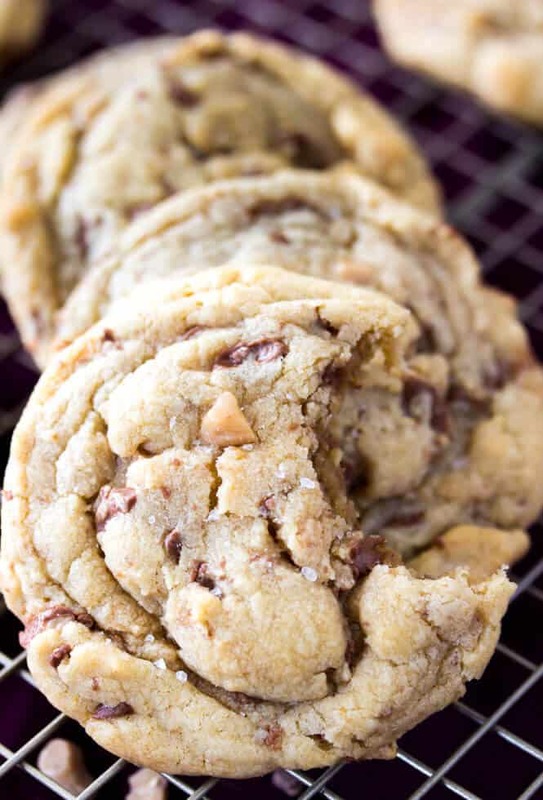 These Brown Butter Toffee Cookies are flavored with vanilla and a generous amount of perfectly browned butter. 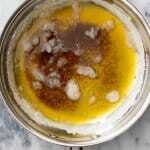 Recipe includes easy steps for browning butter! The inspiration for these Brown Butter Toffee Cookies came to me via the cafeteria of the hospital where I work. After taking our lunch together last week (I think I’ve mentioned that Zach and I work at the same hospital, just in different departments), Zach went to buy himself a drink. As we went through the checkout, I saw small, clear-wrapped package labeled “Butter Toffee Cookies” and immediately threw them at him. I need these — for research! He bought them and the graceless mouth-stuffing research commenced, but I was honestly a little disappointed. They were almost too sweet– there was too much artificial flavor somewhere in there. Faux vanilla, maybe? Some sort of preservative? They weren’t exactly crunchy, but still somehow seemed a little too dry for me. And for a cookie that touted the word “Butter” right in its name, I expected a much… butterier flavor. I had some good starting points, thanks to an underwhelming cafeteria cookie. 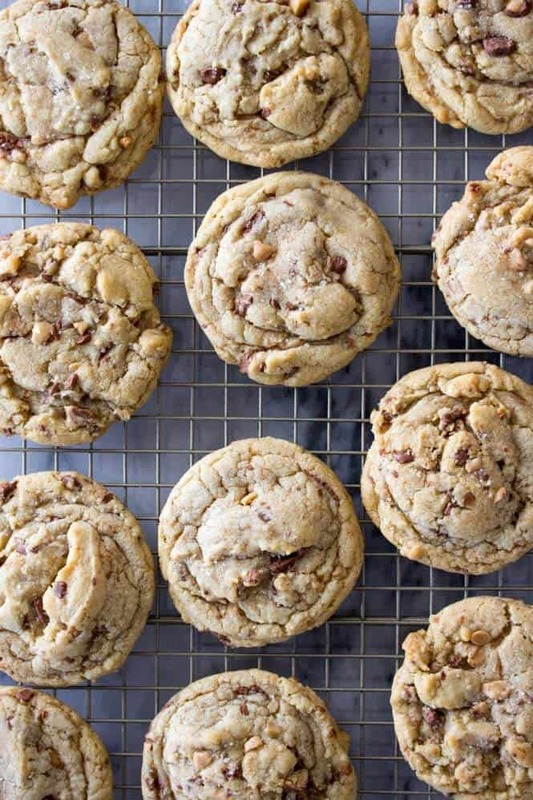 These Brown Butter Toffee Cookies live up to the “butter” part of their name. For the best, butteriest flavor, you’re going to use browned butter in this recipe. You may have spied this ingredient in several of my other cookie recipes, or maybe in my recent brown butter blondies (just… yum). I absolutely adore browned butter because of its nearly nutty, toffee-like (what better complement to the toffee add-ins) flavor. 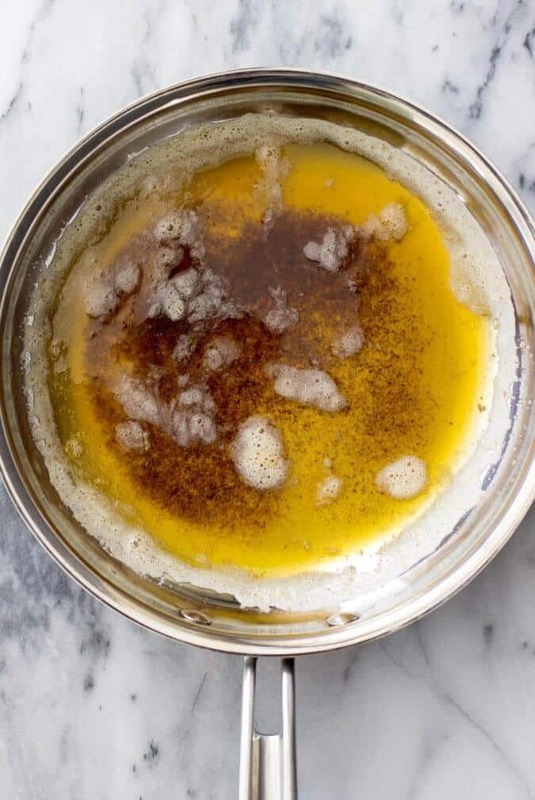 Brown butter used to seem intimidating to me — you have to get out a saucepan and turn on the stove and, yes, watch it very carefully for a few minutes, but it’s really a simple process. The recipe below includes step-by-step instructions on how to perfectly brown butter. Make sure to cool the browned butter for 25-30 minutes before adding your other ingredients, otherwise you run the risk of melting your sugars, and could end up with some seriously runny, unusable dough. This recipe does not require any chilling (I know, a lot of my recent cookie recipes have required fridge time). However, it may be covered and chilled, if you would like, and this would likely give the cookies an even richer, more buttery flavor. Keep in mind that that the dough gets a bit crumbly when chilled and will need to warm back up to room temperature in order to scoop and bake. I have a serious cookie obsession and each time I make a new version I sincerely believe that it’s my new favorite, and these are no exception. 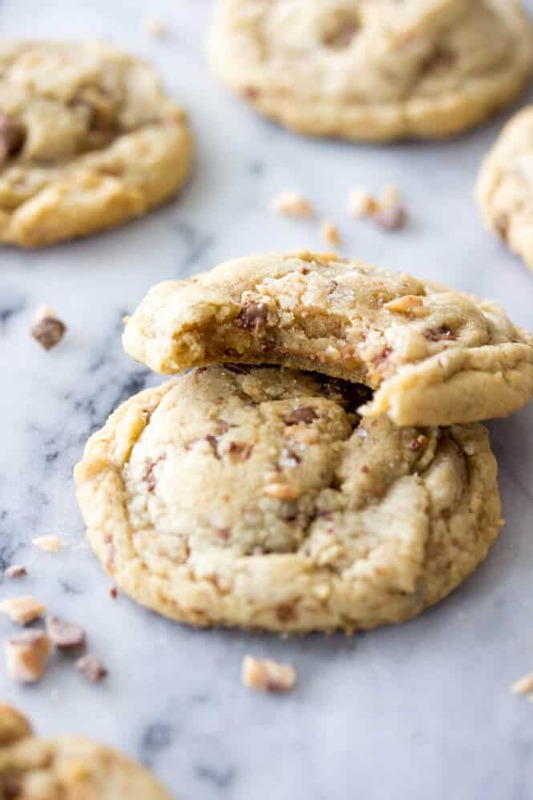 They are so good — slightly crisped exteriors, crunchy toffee bits accented with milk chocolate, and a nutty, buttery flavor in every bite (especially in those soft centers!). 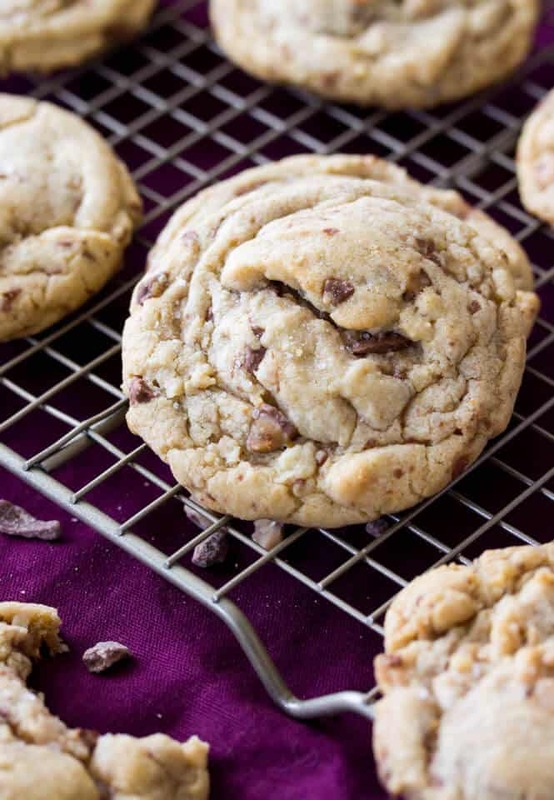 Make sure to top everything off with a small shower of sea salt, which really intensifies all of the already robust flavors of these brown butter toffee cookies. I also cannot recommend strongly enough that you re-heat these briefly in the microwave before eating (about 9-seconds per cookie, in my microwave). Warm cookies are the best cookies. Brown Butter Toffee Cookies: soft & chewy with sweet crunchy toffee pieces and a sprinkle of sea salt! Gradually add flour mixture to butter mixture, stirring until ingredients are nearly completely combined. Add milk chocolate toffee bits and stir until ingredients are well-incorporated. Drop by heaping, rounded 1 1/2-Tbsp scoops onto prepared cookie sheets, placing at least 2" apart. Bake on 350F (177C) for 10-12 minutes or until edges are just beginning to turn golden brown (cookies should still be quite soft when you remove them from the oven, and may even appear slightly underbaked in center). 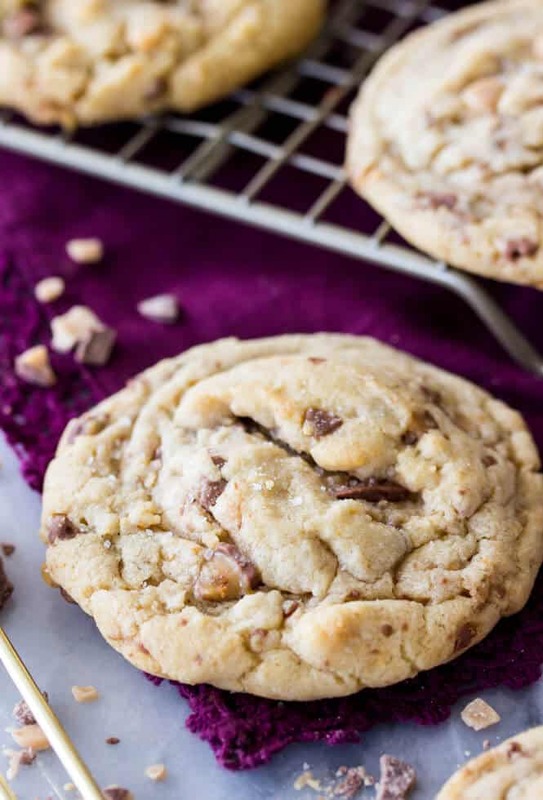 Allow cookies to cool on baking pan for about 3 minutes and then use a spatula to gently scoop beneath them and carefully wiggle them free from the parchment paper, as the toffee tends to stick. Allow to cool several more minutes and then transfer to cooling rack to cool completely. Hello! Wondering if you put the browned butter in the fridge at all? What consistency is it when you add the sugar? Room temp? Slightly melted? Been playing around with browned butter and I’m trying to get it just right! Thanks! Hi Katie! I don’t, I let it sit at room temperature until it is cooled to room temperature (or close to it). It’s still liquid when I use it, though sometimes the top or around the edges of the bowl have started to re-solidify. I hope that helps! I “accidentally” made homemade toffee (one of those happy things that happen when you’ve utterly failed an attempt to make something else!) and found your recipe for these cookies. They turned out to be utter perfection. The browned butter and Maldon salt flakes (my favorite salt) brought in beautiful depths of flavor. I was craving a scratch cookie but didn’t want to wait to soften butter as needed for most. This recipe looked perfect for the moment. And indeed it was! What a great flavor, and so easy. Family says it’s their new favorite. For the last of the batch I thought I’d try adding chopped macadamia nuts and coconut …. that works, too, but the original recipe is amazing. Love browned butter. These are good with other additions…I added chopped walnuts and white chocolate bits. The toffee keeps them real good and chewy, so I don’t think ill leave that out. Crab raisins would be good with the white chocolate. All I know is these are heaven! Just made these cookies. They are delicious! The browned butter gives a marvelous flavor. Wasn’t sure if I would like the salt on top, so tried half of the first sheet of cookies with turbinado sugar instead and Maldon sea salt on the remaining half. Everyone liked both, so I added a little of both to the remaining cookies. Everyone loves them! Will absolutely make again! Five stars!!!!! Do you know if there’s a way to adapt them to bar cookies? They sound delicious, but I’m looking for bar format at the moment. This is my go to cookie recipe base! I omit the toffee and replace with milk chocolate chips and I also add 1tsp of cinnamon to the dry ingredients (flour mixture). I bake for exactly 11 mins and they come out perfect!! Wanted almond flavoring so subbed 1/8c almond paste for 1/4c brown sugar. They came out really good! Thanks for the recipe! Omg!!! Just made these only I swapped the chocolate for just regular toffee & added almonds! My best friend is going to love these. I make him cookies & almond brittle for the holidays and this was like the best of both worlds! I just made these and man, they are AMAZING. Perfectly sweet and salty, chewy yet crispy, just great all around. I was worried because the dough was a bit crumbly but they came out perfect! i ate julia’s cookies and they are delish! i’m going to make some tonight! I am so excited to try these! I just tried making toffee for the first time and the mixture of butter and sugar separated. However the texture and flavor is still good enough to use in another way so I decided I needed to find a recipe to use the broken toffee. I can’t wait to make these cookies with my toffee!